A group of mothers at the Berks County Residential Center in Pennsylvania are on hunger strike fighting for their freedom. The strike is the latest of efforts to shut down the detention center over the last two years. In 2014, various local immigrant rights groups heard of sexual assault taking place inside Berks and launched an effort to shut down the detention center. Berks detainees—inspired by hunger strike at another facility—released this letter demanding their release. Receiving little response, 17 mothers organized a work strike; they were released and quickly replaced with people from another family detention center. 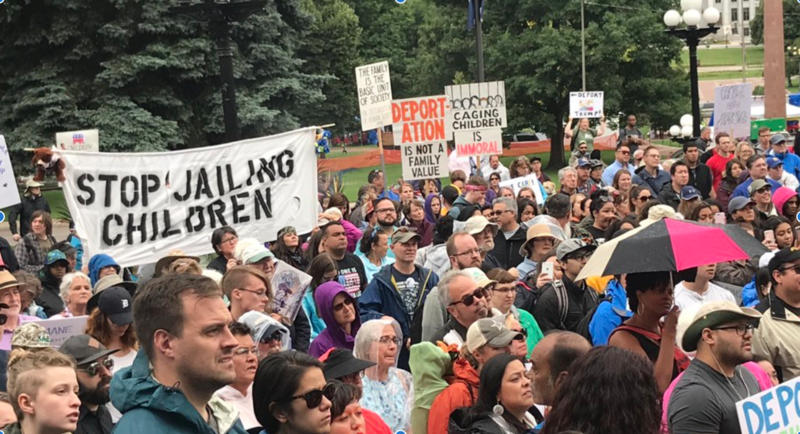 Juntos, an immigrant rights organization in Pennsylvania, hosted an action in front of the Berks Detention Center. Description: Families can be seen standing on the grass looking straight ahead. 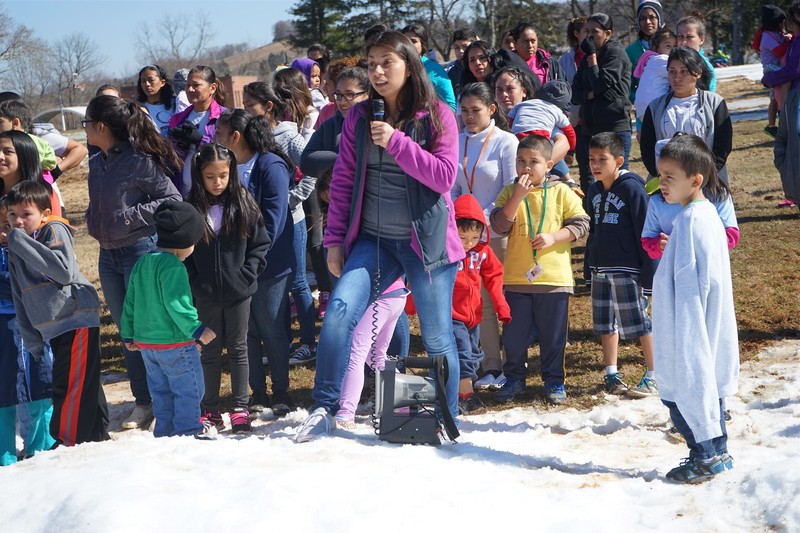 One young woman with long hair is standing on a patch of snow speaking into a microphone. Photo credit: Harvey Finkle. In February of this year, Berks’ license to operate was finally revoked amid complaints and community protests—but the detention center never closed down. Instead, the facility appealed the state’s revocation of the license (the court still hasn’t issued a decision). Frustration bubbled to a breaking point when Department Security Secretary Jeh Johnson defended immigration detention, falsely claiming families were only held for 20 days or less. On August 8, 2016, 22 mothers from the Berks facility launched an indefinite hunger strike demanding their release and challenging Johnson. 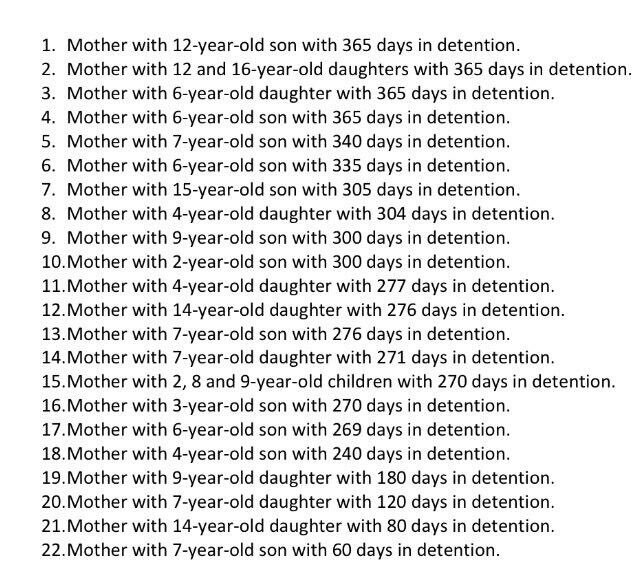 A list of the 22 mothers, the ages of their children and how many days they’ve been held in detention. It is obvious that none of the mothers have been held for 22 days or less. Image via Juntos. In an open letter addressed to Jeh Johnson, the women wrote that many of their children have contemplated suicide and all lack proper care within Berks. Faced with few options, the mothers have resorted to organizing as their only way out. They said they plan to leave the Pennsylvania family detention center either “vivas o muertas”—alive or dead. While organizing puts the families at risk for backlash, risk taking is not new for these women. 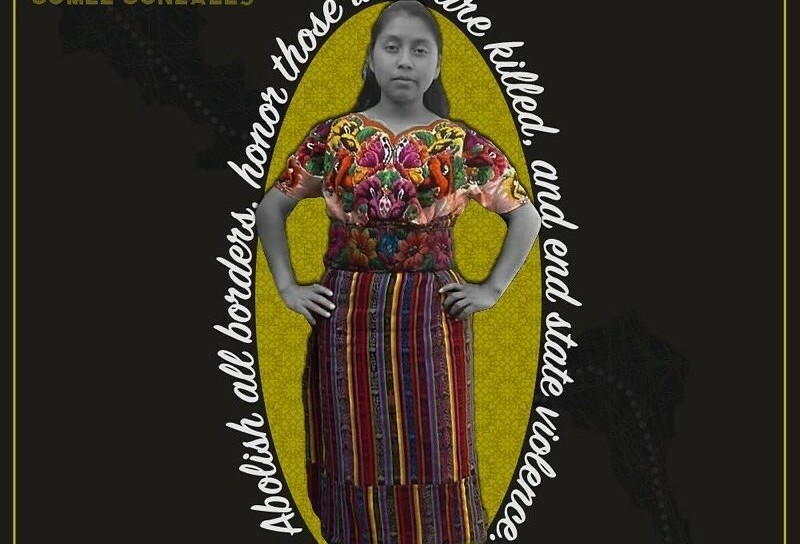 These are 22 mothers who came from Central America escaping violence, corruption, the impacts of climate change, and United States intervention and occupation. Twenty-two mothers who put their bodies on the line more than once: providing for their families in Central America, immigrating to the United States, surviving each day in detention, and finally having no other choice but to refuse to eat. Twenty-two mothers who wanted what was best for their families. Twenty-two mothers who have been retraumatized each day by the country they hoped would protect them. Twenty-two mothers who are fighters reminding us they have power despite being detained. The 22 women on hunger strike are putting everything on the line for the safety of their families. As they enter their third week, the women are rapidly losing weight. We have a duty to these families. We have a duty to share their stories, to take action, to show up in genuine ways, and take action to end all deportations. Signing the petition to shut down Berks and release the families. Calling Thomas Decker, Field Office Director with ICE in charge of the Berks Family Detention Center, 1-866-957-2612 or 215-656-7164 and demand they release the 22 mothers on hunger strike and all families in detention. Calling Tom Wolf, Pennsylvania Governor at 717-787-2500 and demand the families be released. Engaging on social media by amplifying the work organizers are doing to shut down these detention centers. Use the tags #ShutDownBerks, #CloseDilley, #CloseKarnes and retweet posts by local organizations @vamos_juntos_, @paimmigrant, @maketheroadpa, and @Grassroots_News. Checking out this more comprehensive list over at Pennsylvania Immigration and Citizenship Coalition. Header image credit Steve Pavey: Hope in Focus. Angy Paola Rivera is a Colombian immigrant living in New York City. 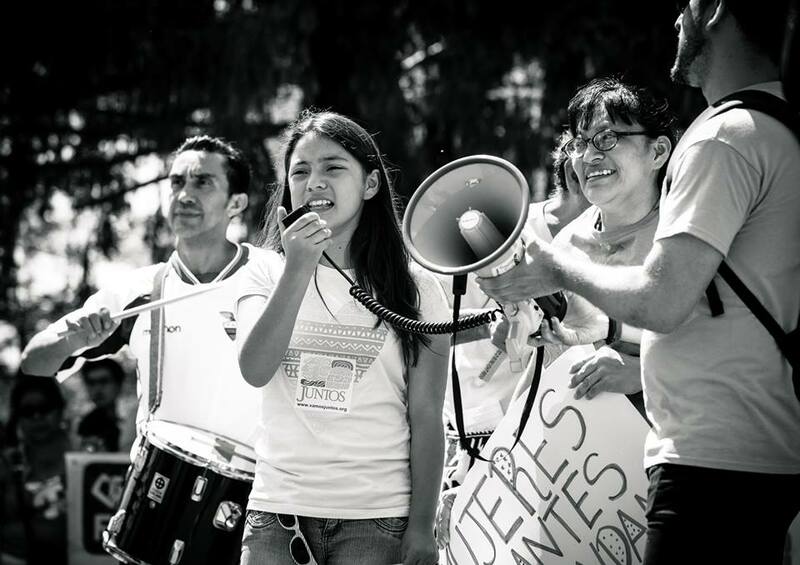 She is a core member at the New York State Youth Leadership Council, an undocumented youth-led organization fighting for immigrant justice through leadership development and community organizing. She created Ask Angy, an undocumented immigrant advice column. In 2012 Rivera met documentary maker Mikaela Shwer who filmed her and her family for the film entitled No Le Digas A Nadie (Don't Tell Anyone). The Peabody award winning documentary, which aired on PBS as part of their POV series in 2015, navigates the difficult reality and double silence Rivera experienced as an undocumented immigrant and survivor of sexual assault. Rivera graduated with her bachelor's degree from John Jay College of Criminal Justice. is a Colombian immigrant and an expert side-eye giver.